The style and origin of this blog are a little different than previous, this one sees the stories of business inform sport which in turn frames some learning back. At Leading Edge we see the ability to ‘sense-make’ as a multiplier opportunity not to be missed. The skills and freedom to sense-make offers far reaching benefits for fast moving organisations where change is unpredictable. Definition: ‘Sense-making’- the processes through which people interpret and give meaning to their worlds (their past, future and present). Drawing on the work of John Alder previously of the Sports Performance Research Institute New Zealand (Auckland University of Technology) now Head of Performance Pathways English Institute of Sport, I share some of his ‘commentary’ on ‘sense-making’ from the world of ‘performance sport’. In applying ‘sense-making’ to the coaching process, the athletes (aka. team members/employees) and coaches come together and collectively experience events. John cites Weick (1995) in that “sense-making is about authoring as well as interpretation, creation as well as discovery”. What are you doing to allow people to author personal meaning? How are you supporting the interpretation and creation of new perspectives? When do you plan in time for discovery? John cites the work of Maitlis and Lawrence (2007) – ‘Sensible environments’ are shaped by identifying and understanding sense-giving triggers, enabling the act of ‘sense giving’ by leaders and members. What physical spaces do you have for sense-making? What formal and informal spaces do you have for sense-making? Who are your sense givers? John shares – It is important to note that for the coach there are two layers of sense-making that one needs to be cognisant of; sense-making of the ‘athletes’ and their response to coaching, as well as that of the coach as a consequence of his or her experience. How are you using the your time with employees to build awareness of self? What are you learning about yourself through the process of awareness of self? Could you be sharing your journey with employees? John cites Weick (1995) – “navigating by means of a compass rather than a map”. It is argued that whilst maps may be the basis of performance but in an equivocal, unknowable world, the compass is the basis of learning and renewal. How do you provide direction over didactic instruction toward a destination? How are you helping employees develop their compass and navigation skills? What maps of the past need to be put to one side to allow for new routes? In a complex world where technological and the political landscape is changing at such a pace, where do you make sense of stuff, … who do you make sense with… how do you help others make sense of stuff…? “Sense-making is not about rules, and options and decisions. Sense-making does not presume that there are generic right answers about things like taking risk or following rules. Instead, sense-making is about how to stay in touch with context…The effective leader is someone who searches for the better questions, accepts inexperience, stays in motion, channels decisions to those with the best knowledge of the matter at hand, crafts good stories, is obsessed with updating, encourages improvisation, and is deeply aware of personal ignorance”. Maitlis, S. & Lawrence, T. B. 2007. 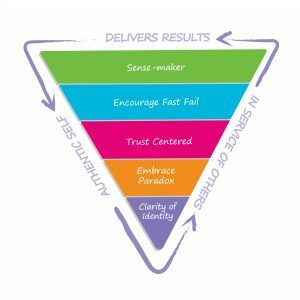 Triggers and enablers of sense-giving in organisations. Academy of Management Journal, 50, 57 – 84.